Last week, the smartphone maker InFocus sent out invites as they were planning to launch a new smartphone with a big battery on June 28 in India. 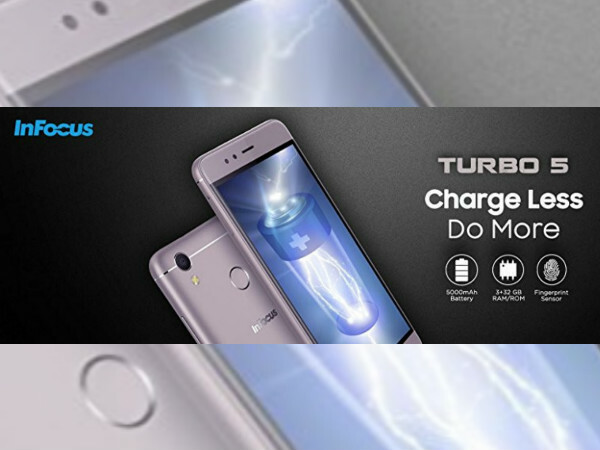 Now, the online retailer Amazon India confirms that the device will be dubbed InFocus Turbo 5 and reveals its specs and design too. The placeholder on the Amazon India website shows that the InFocus Turbo 5 will get the power from a 5000mAh battery that assures to give up to 23 hours of talk time and up to 816 hours of standby time respectively. Also, this smartphone is said to help in charging other phones with OTG. The other aspects as revealed by the retailer’s website include a fingerprint sensor at the back, unibody metal design, a 2.45mm narrow frame and Android 7.0 Nougat OS. Detailing on the specifications as listed by the retailer, the InFocus Turbo 5 to be launched tomorrow is said to boast a 5.2-inch HD 720p On-Cell IPS 2.5D curved glass display. Under its hood, the smartphone is listed to employ a quad-core MediaTek MT6734 processor paired with 3GB RAM and 16GB of storage space that can be expanded up to 32GB with the hybrid SIM card slot. The imaging aspects of the upcoming InFocus smartphone are said to include a 13MP main snapper with LED flash and a 5MP selfie camera too. The other goodies on board the Turbo 5 are listed to be support for 4G VoLTE, Bluetooth 4.0, Wi-Fi, GPS and a 5000mAh battery. For now, there is no word on the possible pricing details of the InFocus Turbo 5 and we can get to know the same only when it is launched tomorrow. Notably, the listing shows the smartphone in the Mocha Gold color variant.